The Digital Kennedy project is a collaboration between the Digital Design Center at the University of North Carolina at Charlotte (UNCC) and UNCC Information Technology Services. This joint project is investigating opportunities to renovate the Kennedy academic building on the UNCC campus. The Kennedy Building is iconicly linked to the history of the campus, as it is the oldest university building. Currently housing the administration for the ITS Department on Campus the new Vice Chancellor of Information Technology foresee’s this building reemerging as a central point of focus for the University students. Asked to explore ideas about the redevelopment of the Kennedy Building, the Digital Design Center at the School of Architecture began to reconceptualize how the spaces within the Kennedy building could be rethought. The current proposal calls for utilizing the central location of Digital Kennedy to serve the campus at three divergent scales: Community Scale, Campus Scale and Group Scale. The Kennedy building will service the Community Scale of the UNCC community through the implementation of a campus radio station, an amenity that is currently not available at UNCC. Information, both practical (where to park) and intellectual (live feeds of lectures, streaming results of events) are streamed to the wider community 24 hours a day. This information will be managed from within the digital DJ booth, located just inside the entrance of the Kennedy building. Input nodes located throughout campus allow students to request songs or post to a Twitter-like feed that will be displayed throughout the building and broadcast over the station. At the Campus / Quad scale the digital media broadcast through the radio station will be focused and displayed throughout the Kennedy building as well as on its exterior. 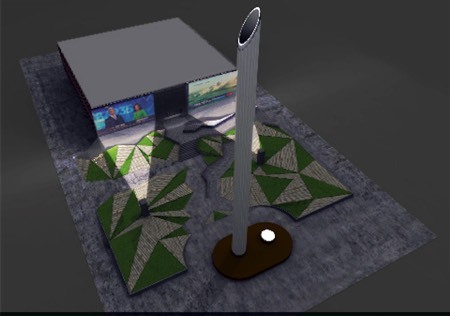 Through the use of digital display technologies the students will be able to interact with the buildings displays through a series of kiosks arrayed around the campus and directly from their web enabled smart phones. The interior of the building will focus on a variety of student group scales who currently do not have a formal space for meeting on campus. The second floor will become a destination for engagement with digital technologies that can become a highlight of their education. Utilizing existing technologies such as a Social Computing room, touch enable displays and a variety of integrated technologies to explore their educational goals.